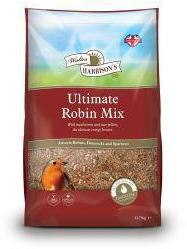 Walter Harrisons Ultimate Robin Food specially formulated with high energy ingredients including suet, mealworms and sunflower hearts. Perfect for feeding Robins all year round. 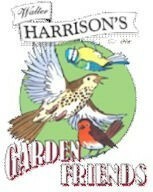 Can be fed from a seed feeder, but best fed on a bird table or on the ground. ROBIN ENERGY BLEND This specifically formulated mix of high energy ingredients matches the dietary preferences of this friendliest of garden visitors. Robins are naturally attracted to mealworms which provide high levels of protein, while the highly nutritious seeds and suet content of this blend gives extra energy during the busy summer months and protects against the harsh conditions of winter. Other ground feeding birds like thrushes, blackbirds and wrens also find Robin Energy Blend irresistible.